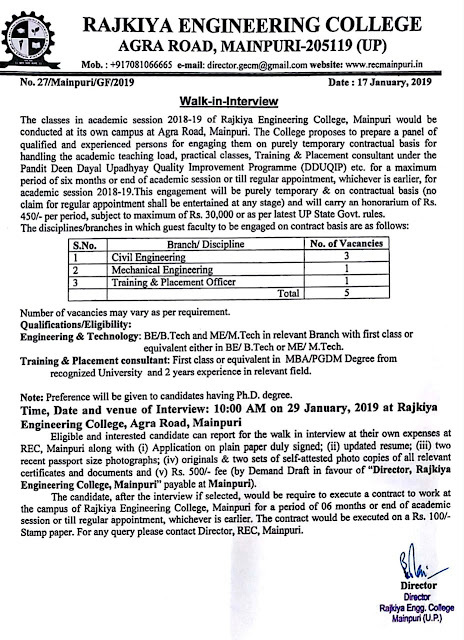 Rajkiya Engineering College, Mainpuri has advertised for recruitment of Guest Faculty / TPO jobs vacancies. Interested and eligible job aspirants are requested to walk-in on 29th January 2019. Check out further more details below. About College: Rajkiya Engineering College, Mainpuri (RECM) is an Academic Institute established for imparting quality education and passion for excellence. It was established by the Government of Uttar Pradesh in the year 2015 with single branch Civil Engineering with annual intake of Sixty (60) students running at Harcourt Butler Technological University, Kanpur (formerly known as HBTI, Kanpur). In 2016 two more branches have been added namely, Electrical Engineering and Mechanical Engineering with annual intake of Sixty (60) in each branch. The college is affiliated to Dr. A. P. J. Abdul Kalam Technical University, Lucknow (Formerly Uttar Pradesh Technical University, Lucknow). The college will be shifted from H.B.T.U. campus to its own fully residential campus located at Mainpuri in the month of July 2017 and all academic activities from the session 2017-18 will be carried out at its own campus. The college campus consists of Academic Building, Workshop, three Hostels (2 Boys and 1 Girls), Students Activity Centre, College Canteen, Grocery Store and other facilities for recreation. The walk-in will be held in the following venue.